When you are registered on our website, we collect your name, email address, postal address, billing address, credit card number, expiry date and CV2 code. Under no circumstances are credit card details stored or shared with any other third parties, for security and privacy reasons we do not hold credit card details. Your information is used for your registration, the process of your orders, and the delivery of your purchases. The relevant information is then used by us, our agents and sub-contractors to give you information on your account and to communicate with you on the management of your account and your orders. We may also contact you about other products and services we think may be of interest to you, only when you give us the authorization to do so. improve ad targeting and measurement, including through the use of your precise location data. We may provide your information to our customer service agencies so that we can improve our services and you may be contacted to provide feedback and comments on our goods or services. We may also provide you with information about special features, products or services we think you might be interested in. We may also want to provide you with related information from third parties for the same reasons. 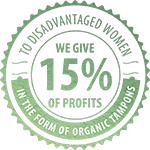 If you would rather not receive this information, please let us know by writing at: customerfirst@organictampons.co.uk . We may also provide your information to carefully selected third parties. If you do not wish to share your information with those third parties, please contact us at: customerfirst@organictampons.co.uk, clearly stating «PLEASE DO NOT SHARE MY INFORMATION» in the subject of your message. To protect your personal information, we take reasonable precautions and follow industry best practices to make sure it is not inappropriately misused, lost, disclosed, changed or destroyed. Although no method of transmission over the Internet or electronic storage is 100% secure, we follow all PCI-DSS requirements and implement additional accepted industry standards to protect your information.